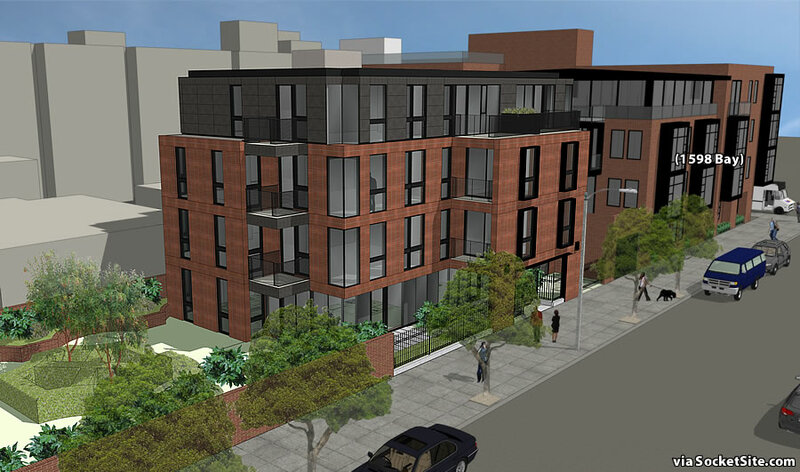 The plans for a four-story building to rise on the southern end of the historic San Francisco Gas Light Company’s parcel in the Marina, where a former workshop addition flagged 3620 Buchanan Street currently sits, has been redesigned by Ian Birchall and Associates. Originally envisioned as a mix of six residential condos over two floors of commercial space and a storage room for six bikes, the new design would yield eight residential units (a mix of four one-bedrooms, three twos, and one three), with off-street parking for eight bikes and one handicap accessible van/car space. 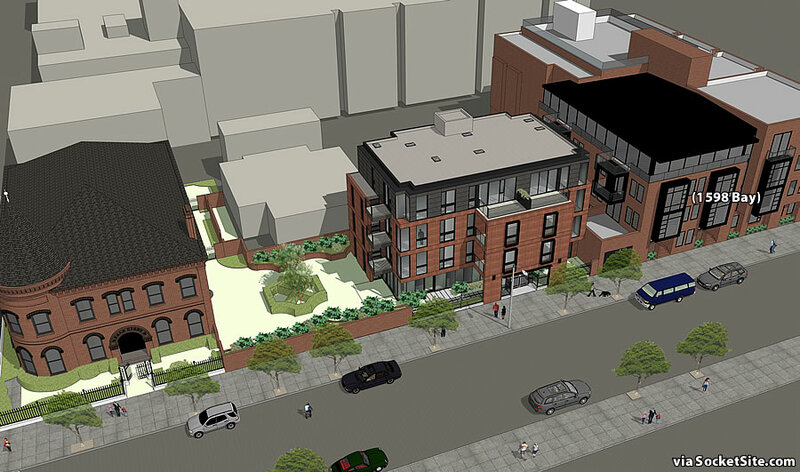 And the proposed building’s finishes have been revised in an attempt to be more “compatible” with both the adjacent landmark building and the new four-story infill building finishing up construction on the former gas station site at 1598 Bay Street next door. “If the proposed Project moves forward as constructed, a dark tunnel will result that provides minimal access to light and air to the abutting residential units in 1598 Bay’s residential development. And with respect to the plans for providing only one off-street parking spot for the eight new units, in light of “the fact that residents of the [proposed project] are…likely to be car owners and will need a place in which to park their car,” and “the proximity of other residential projects in the neighborhood…already crowd very limited on-street parking,” the owners association for 1598 Bay is formally opposed to the granting of any variance to San Francisco Planning Code Section l 51(b) which requires a minimum of one off-street parking space per dwelling unit upon the site. WHY is there an ad to “chat with mature russian ladies” on here??? Speaking of employment, it seems like NIMBYism is an amazing employment opportunity for lawyers. “we intend to provide further comments” means more juicy, juicy billable hours. Don’t vorry… Vee are actual mature Russian ladies, not young spies here to help influence your vote in the next election, comrade. Totally ridiculous and hateful. The city wants more housing and less cars. The building looks fine. Highly doubt the developer next door cares about anything they mentioned. They just care about the profit as they are about to go to market and this project will affect their bottom line. GREEDY! Greed driven NIMBYism. The developer isn’t interested in views/light other than to use them to garner a larger profit – unlike the residents of Baycrest who have lived there for years and will have much of their light and view taken away by the proposed apartment project across the way from them. Many of the newer SOMA housing blocks have been blocked (view and light) by newer adjacent structures. Not sure how much weight this argument will carry with Planning. Maybe a slight re-design to pull back the newer building’s adjacent façade a bit. If Planning regulations were a bit more flexible a 5th story could be added and the building pulled back maybe 15 feet. 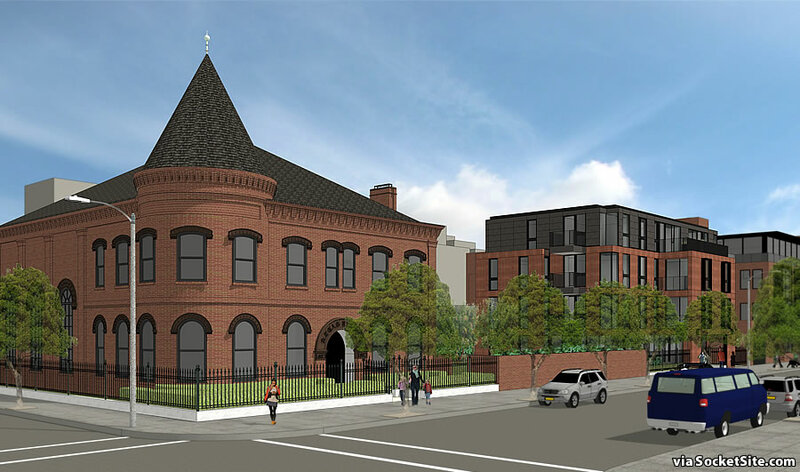 The proposed design is nice with the brickwork and broken up façade It would help to do some articulation at the roof to carry over from the steeple/angled roof of the landmark building. As to the blank stucco wall – agree they detract from the cityscape – hire an artist to do a mural on that wall and tie it into, subject wise, the historic nature of the area. It seems that the 2 buildings – and honestly don’t they look like parts of the same development? It magnifies the weirdness that the developer of 1598 is trying to go all ‘Fountainhead’ on us – express that roof through the black cladding on the fourth floor (i.e. colour- rather than design matching). I don’t think a similar roof profile would work since they’d have to give up a whole floor (or raise it higher…which would upset the neighbors even more) This might seem like a situation tailor-made for a mansard – indeed they were designed to squeeze an extra floor in – but it’s become so cliched I think it’s better off not going in that direction. 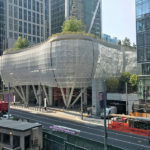 If you go to this SF Gov link and see page 18, you’ll see there is NO STUCCO on the rear, east-facing facade of the proposed building at 3620 Buchanan. I think it will be a handsome addition to the cityscape. One way to fix that situation is to simply use frosted glass. That way you get most of the light none of the privacy problems. Of course frosted glass eliminates the view, but how valuable is a Honeymooners view of a brick wall anyways? If you look closely at the design for 3620 Buchanan, you will see that the architect has dealt with this in several ways and none of the units at 3620 Buchanan look directly into units at 1598 Bay. I’d love to be a commissioner who could ask the people opposed to the new development “what data do you have to substantiate your assertion that “that residents of the [proposed project] are…likely to be car owners and will need a place in which to park their car” ? Did they do some back-of-the-envelope calculation of the future selling price of the completed units and then assume that anyone who can afford that prices is going to have a car? If so, I’d love to see that financial model. maybe they just said to themselves, “hey, this is the Marina”. 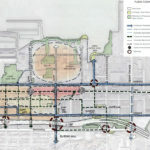 A lot of the board right now is neglecting the alternative mobility options that would reduce the need for parking, and they either need attitude adjustments or to be voted out. I’ve been in the Marina since the 1940s. 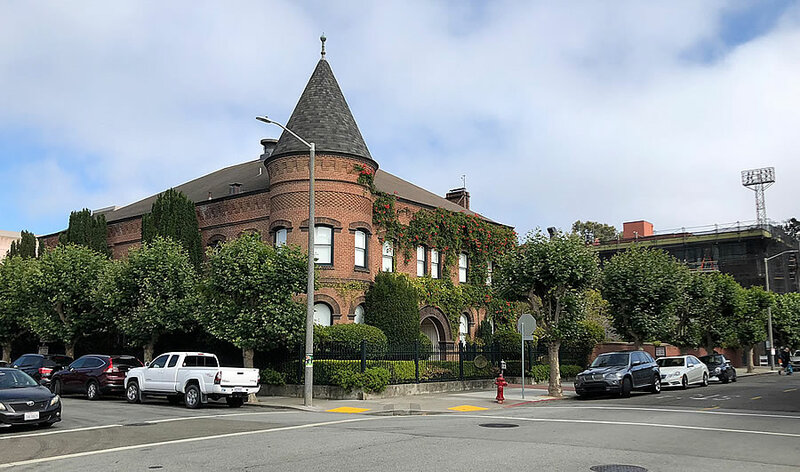 The beautiful old SF Gas & Light Co. building (circa 1893) briefly called Merryvale for a few decades) is definitely landmarked, but NOT the one-story wooden building at the south end of the garden. It was built in 1958 to sell plants and garden sculptures. The garden was designed by my friend Penney Magrane in 1999, so it’s definitely not landmarked. The new building removes the 1958 wood-frame building, creates 8 new residential units AND keep about 80% of the current open space (the lovely Magrane garden). Also, there is NO stucco in the current design for the new building at 3620 Buchanan – I’ve seen the complete design. The developers at 1598 Bay know this and they know views are not protected in SF. I hope they are disclosing to potential buyers with north-facing views that a new four-story building is going in next door… Talk about pulling up the ladder behind you. 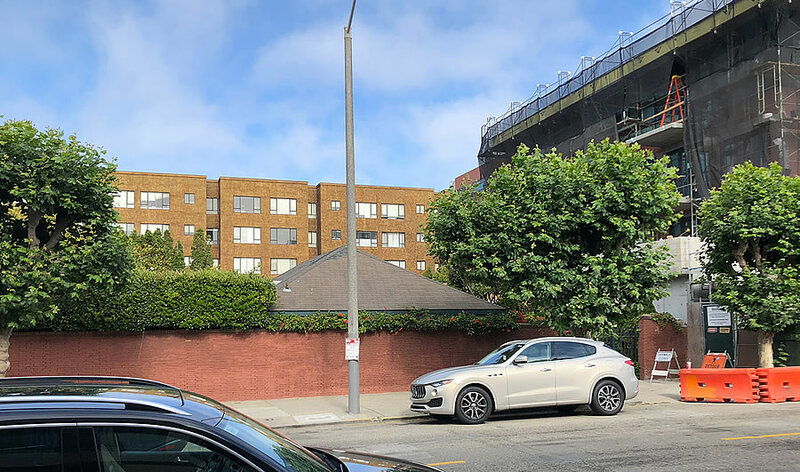 If there was any justice, the hypocritical NIMBY developer of 1598 Bay (Mark Conroe, aka “Presidio Development Partners LLC) would have his permits revoked.